Camille and Carrie have been hosting a little first quilt parade – where everyone is supposed to share their first quilt and their latest quilt. I had until last night to post about it, but a few things came up and I didn’t get it done. But, I decided I’m going to post anyways, even if I am a day late for the party. My First quilt is called the Cottage Sampler. It was 1994. I was a freshman in college, home for a week on Christmas break. Please don’t try to visualize my hair. I loved heavy metal rock bands and my hair showed it. Instead, just picture all the hand made things around your house. The fabrics in my quilt were probably quite similar to those items. There are oodles of quilters in my area that have all made this quilt. Our local quilt shop, DarLin Quilts offered this project as a class for those interested in learning to quilt. The prerequisite was that you were supposed to take the Beginning Beginner’s class. I kind of skipped that part. That might explain why my points don’t exactly match. Lin, who owned the shop, was an excellent teacher and my mom was currently taking the class. At the time, I lived at home with my parents, so my mom was available to help me 24/7. By the end of the week, I had the top pieced and bordered, but had no idea how to finish it. Again, Mom to the rescue. She layered it and quilted it with a 3-step zigzag on her Bernina. See? Now, this isn’t really considered a beginner quilt – but I was a beginner, I didn’t know that! 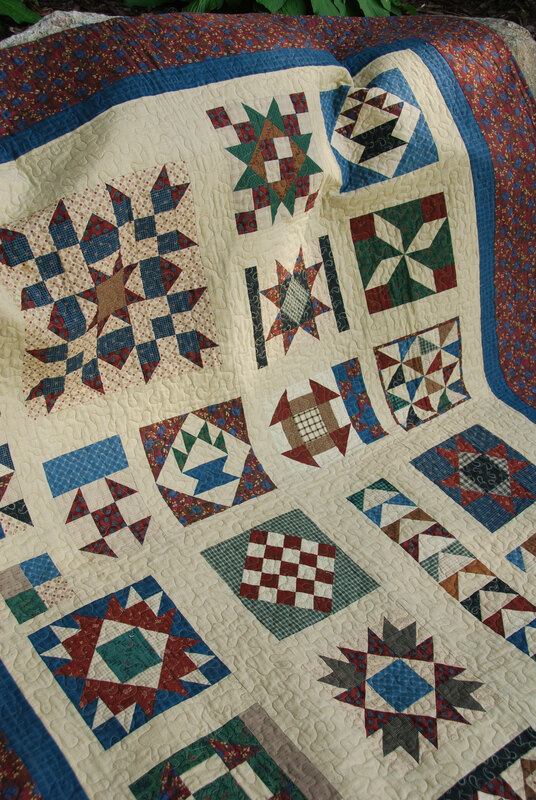 It turned out to be a lucky mistake on my part, as sampler quilts really teach you the foundation for quilting. You learn to strip piece, make half-square triangles, quarter square triangles, square-in-a-square blocks, flying geese, etc, etc. After making this quilt, I was able to look at many patterns and see how these easy blocks are used to make many of the blocks that we still use in quilting today. I learned a valuable lesson – most complicated blocks can be broken down into several easier blocks. I still love that concept today. Shortly after I finished that quilt, I made my first trip to a quilt shop and thought I’d died and gone to heaven! I also realized my fabrics weren’t that . . . well . . . . trendy. So I bought new fabric (what was trendy at that time) and made the quilt again. Thus began my love affair with color options. 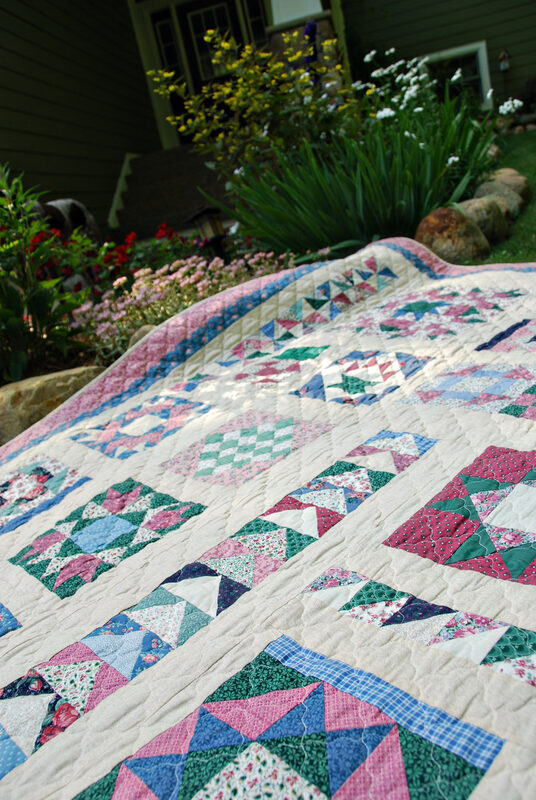 The same quilt pattern can look so different just done up in different fabrics – another valuable lesson learned. 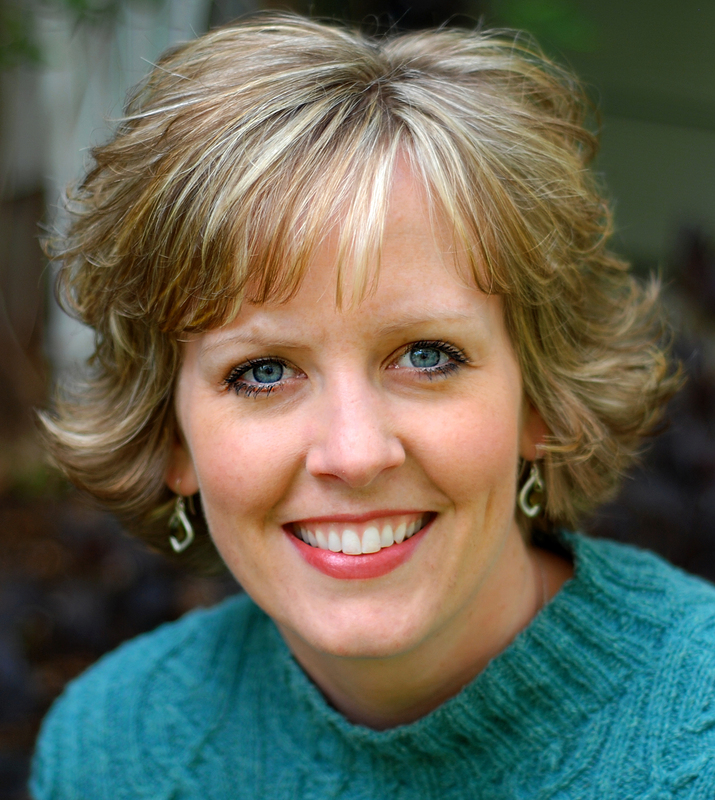 For those of you who read my blog regularly, you know I still love to make color options! I did quilt and finish this one myself, though I’m sure Mom would have helped if I needed it. For those of you who are considering getting into quilting, let me just say that quilting can be highly addicting. It may also cause obsessive fabric collecting, stressing over color combinations, and the need to go to quilt classes and retreats. YOU had hair band hair?! NO WAY! So? Which band was your fave??? Your quilt is lovely. The first one I made, I never finished, but it was a sampler too. My first quilt is still unfinished. I started it in 2000. It just needs a binding. And dang…I still like it very much. I really should finish it. The only quilts that get finished and used are the flannel raggie quilts I make for the grandchildren. 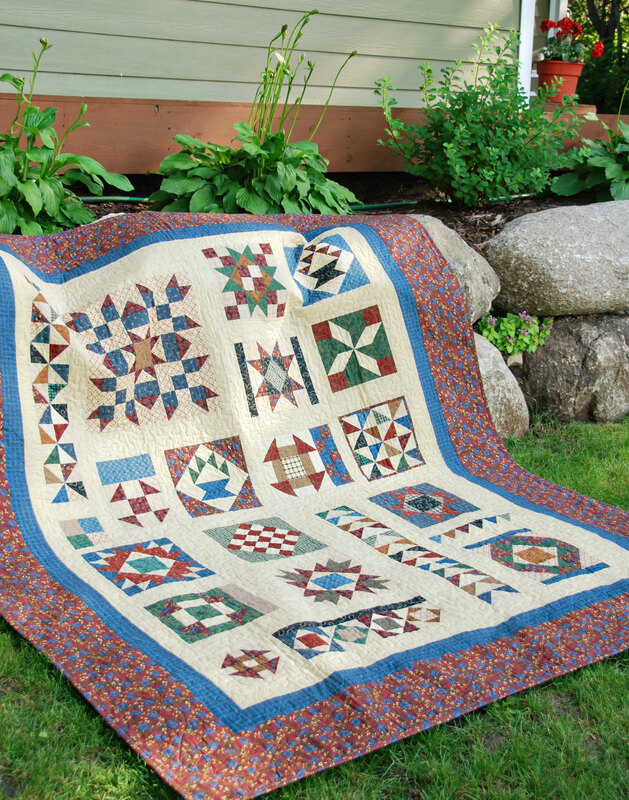 That’s okay…I want to make LOTS of raggie quilts. What a wonderful first quilt…I’m feeling soo inadequate right now…we started quilting at close to the same time…and you are just amazing! Can’t wait to see your new designs! Love your first quilt! I too did a sampler class for my first quilt and like you I learnt A LOT. It was the best thing I ever did and I had a wonderful patient supportive teacher. Now I need to look through your other quilts and see how you’ve progressed. That was your first quilt?? So basically, you just started out being amazing. I’m always so impressed with you, but you already knew that. I knew it. You didn’t have to learn like the rest of us. You were born knowing how. And quilting perfectly on your second quilt?? That’s just not fair. And what in the world is rock band hair? I wish I had seen it. 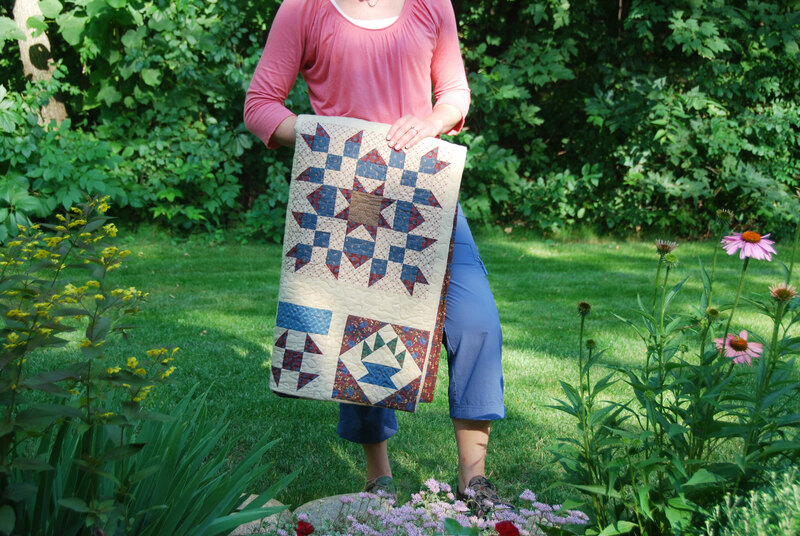 I am noticing a trend – many of you who are now quilting super stars, didn’t begin at the beginning! You all began at advanced! Great first quilt Heather! 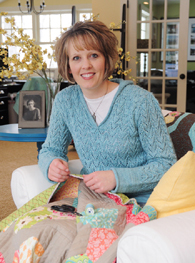 Love your first quilt…It is evident that you were born with needle and thread in your hand.. I agree, however, that a sampler is the best project to get a taste the varity of technique. Wow! THAT was your first quilt? Amazing! I joined in Camilles Parade of quilts too, but it’s my first and only quilt that I haven’t finished yet. But the quilt top is done except for a little bit of embroidery. I look at everyone else’s (yours included) and feel so inspired to do more! I told my husband I’m signing up for a class on payday. The quilt top I just finished I felt I could do by myself, but I’m gonna need help with anything else!! You are so right about sampler quilts being a wonderful introduction to quilting. I also love the fact that by the time the class is over (six or more weeks), you have made some quilting buddies! Your first quilts are lovely, which is no surprise to me! 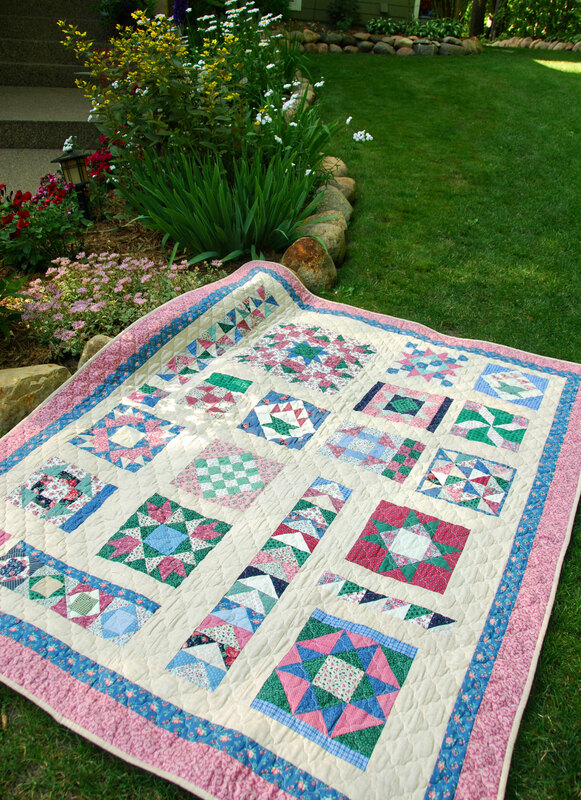 My first quilt was 12 yrs ago for the baby shower for a grandson. It may have been called “Cobblestone”, under the guidance of my daughter, Maureen, who is so skilled at quilting. When she was ten, I sent her to a sewing class at the Singer store.She proceeded to become so good that she made her own wedding dress that was the style of Princess Diana. My most recent, almost finshed is ” Lucky Stars” by Terry Atkinson, is for a bride to be. Just love the simple directions. Having been an avid crafter for many years, I’m now looking forward to quilting more often. Great sampler quilt. So cool to see you made it again in a different color way. I can’t believe that was your first quilt, it is very well done. I agree with the others – you skipped the beginner stage! I’m so late in getting around to seeing your first quilt ~ quiltS ~ which, of course, are awesome. But as wonderful as your quilts are, and as much as I enjoyed reading the story about how you got started quilting, I’m like everyone else here ~ I’m WAY more curious about the hair! Favorite band? Was your hair big and poufy? Short and spiky? Bleached, streaked and wild? Details, girl!! We want details!! Heather I thoroughly enjoyed your trunk show last night. I can’t believe you don’t have batiks in your stash. You have to come back through Big Timber Montana to get to Minnesota. Might I suggest stopping at Little Timber Quilts to check out some of the best? I made 12 Christmas tablerunners last year for christmas from Charmers 1. Keep up the great work!! !